large-scale commercial, industrial, & municipal projects. 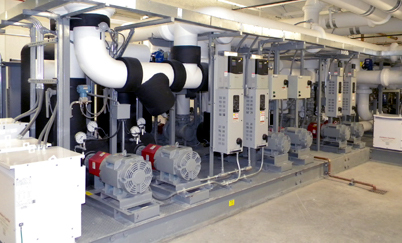 Let us develop a high performing HVAC solution for your facility that will increase comfort and reduce energy expenses. Reduce downtime and keep your systems running at peak efficiency with a reliable, 24/7 yearly service contract. Our team of licensed Master Plumbers specialize in process piping and developing unique solutions for complex applications. Monroe Plumbing & Heating Company is a full-service mechanical contracting company specializing in industrial and commercial construction. Since 1948, our staff of specialists and skilled mechanics has successfully completed hundreds of jobs ranging from the largest retail store in Michigan, Cabela's in Dundee, to emergency back-up systems for the University of Michigan's University Hospital. We're dedicated to executing every project with accuracy, accountability, and high-performing solutions for complex projects. When you choose us, you can rest assured your project will get the level of attention and commitment it deserves. For more information about our experience and background, to request a bid for your project, or to schedule service, contact us today to speak to a member of our team.